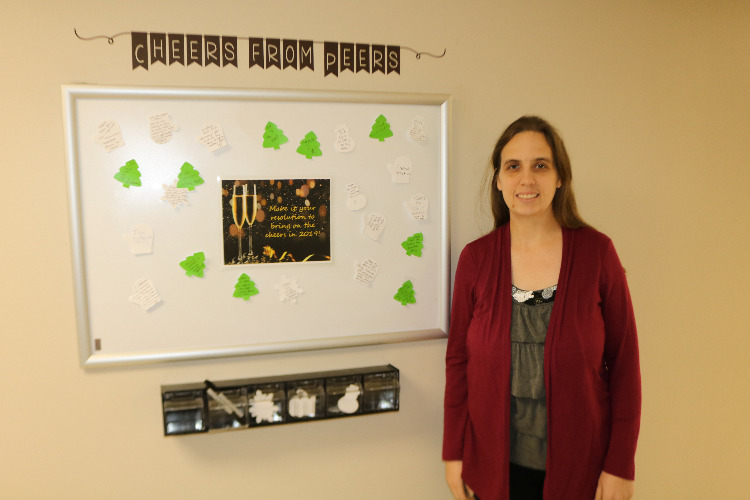 Amy is an Office Support Professional, and has been with DSC for over a year. As part of the Front Office Team here at DSC, she is part of the first impression a family member or member of the community may see when they walk through DSC’s front door. In addition to helping with the phones and greeting people in the office, her responsibilities include things like updating timesheets and filing paperwork for case management. One of the aspects of her job she is most passionate about, is Employee Engagement and Employee Recognition. In 2018, she was instrumental in implementing the Cheers for Peers board at the Main Building. The board serves as a simple way employees can recognize one another, by writing out notes on a designated board near the Front Office. Many employees have remarked about how encouraging they find the concept. Amy credited the Front Office Team for coming up with the idea together. On the Employee Engagement side of things, Amy is involved with planning staff gatherings, such as the Halloween Potluck, and the DSC Annual Fish Fry. These events often include themes, prizes, games and fun. Outside of DSC, Amy is married and has a son who is 22 months old. She enjoys spending time with friends and family, playing cards and loves to read. She’s always open to having a conversation about sports, if you want to stop by, especially Cardinals, or Illini Women’s Basketball and Volleyball.